Please excuse the naked painting in the store window. YEAH ! 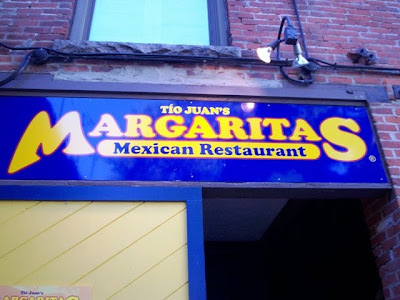 Laura won a $ 50.00 gift certificate to MARGARITAS MEXICAN RESTAURANT in Mystic, CT. So Saturday, around 2:30pm. we left for the 1hr.&15min.trip up there ( the lengths we'll go to for free food ). lol Since we wanted to make the trip a little more fruitful, we decided to visit the other 2 places mentioned above also. We followed our faithful GPS right to the quaint center of downtown Mystic. They were having some sort of summer festival and the streets were very crowded ( plus they're right near the seaport, the original Mystic Pizza from movie fame, and many restaurants and touristy things ). 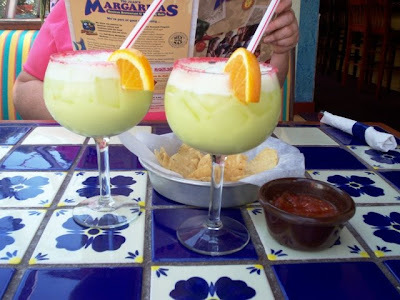 We found MARGARITAS, pushed back from the street, in an old renovated mill building, but could find no parking. Up and down the street we went to no avail. So we pulled into a public lot and were dismayed to find it would cost us $ 3.00/hr. to park there. When told we were visiting MARGARITAS the attendant gave us a ticket to be validated by the restaurant that would give us one hour free. OK. But now we had to walk all the way back to the restaurant. Bummer ! The original Mystic Pizza - only a street away from Margaritas! Outside of the restaurant we climbed the 5 little steps that would take us inside ....to more steps. Now here's where I'm going to get dramatic. I have a BIG problem with stairs.#1...I'm very lazy. #2 ...I do have a medical problem that makes stair climbing very difficult for me ...not impossible...just difficult. So faced with a long flight up and looking around ( to no avail ) for an elevator, I just grabbed on to the handrail and started up. Then we hit a small landing and another set of stairs .OKAAAAAYYYY Surely we'll be rewarded with the restaurant when we land . NOPE ! There was a hostess at a desk and she informed us that we could eat on this level if we wished to eat " alfresco " but the deck was pretty filled. Was this it ? 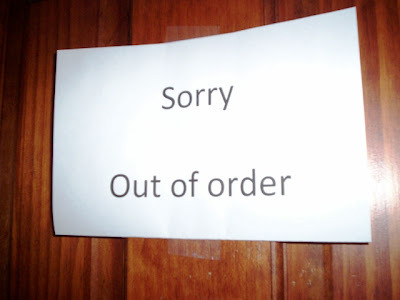 Was this the whole restaurant ? NO! 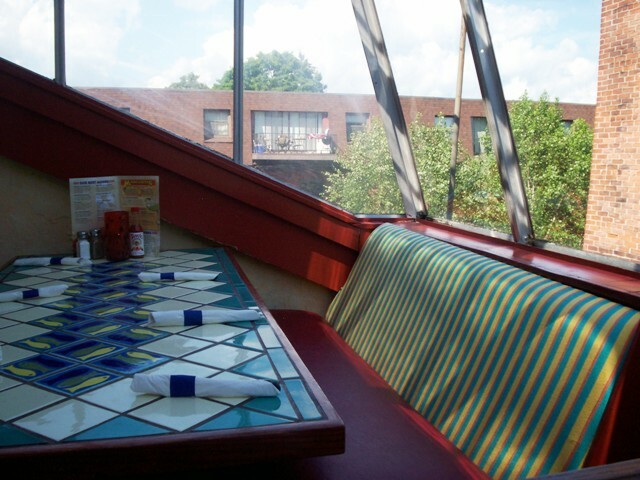 The dining room , we were informed, was UPSTAIRS! YOU HAVE TO BE KIDDING ME !!!!!! This was me in a none too quiet voice. I kept thinking , free $ 50.00, free food, you can do this. So up we went ,another flight ,another landing ,another flight and then right into the restaurant , RIGHT ? NO ! Another small few stairs and we had made it . Now Laura calls this 2 1/2 flights but I say it was 4 1/2 . IT FELT LIKE 20 ! Now on one of the restaurant sites it mentions that this place is NOT handicapped accessible, so I guess they're covered. But not everyone reads about a place before they go there. What if we had showed up with someone in a wheelchair, or my sister-in-law who has heart problems. We would have had to leave after having driven over an hour to get there. STINKS ! Nothing you can do about it but it still stinks. Enough about the stairs. Once seated ( around 4:00pm.) and I could breathe again I noticed how pretty this place was . We were high up ( stairs ) and had a window seat with a great view. We even saw some ships sailing by. Nice. Our very friendly waitress came over with chips & salsa and took our drink order .We usually only get soda but hey, this was free, so we both got a COCO LOCO . It tasted of coconut and rum and pineapple , like a pina colada , and was delicious. I chugged mine down , forgetting it was made with alcohol. Hey, I was thirsty ( stairs ) . 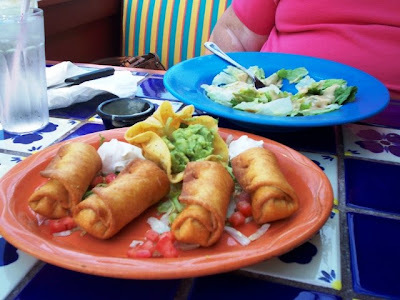 While serving our drinks , our efficient waitress asked if we'd like an appetizer .We did, and ordered chicken baby chimis , 4 small chicken & cheese chimichangas with sour cream and guacamole . They were fantastic. I could have made a meal from these.Their wrapping was crisp but not break-apart crunchy. And the filling was so tasty with the shredded chicken and melty cheese.I wish I had this right now. 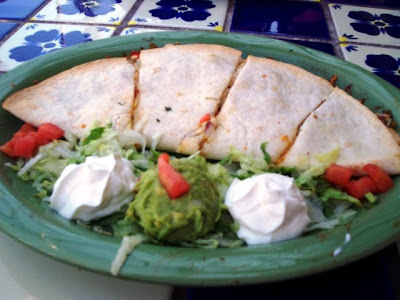 For our main dishes Laura got a chicken quesadilla extravaganza .Her tortilla was filled with chicken, green chilies, cilantro ,tomatoes,red onion and cheese. It was accompanied by sour cream and guacamole. She loved this and said it was so flavorful. 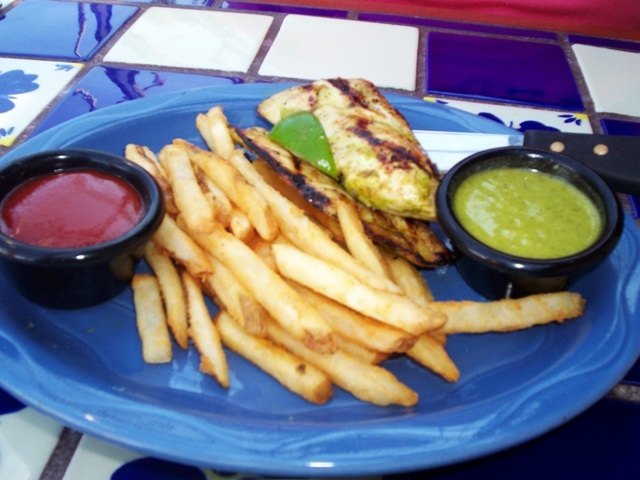 I ordered the tequila cilantro chicken which was 2 chicken fillets ,marinated in lime and cilantro and grilled perfectly. I chose fries as my side dish and they were crispy and dry, just like I love them. I also had an ice cold salad with the most delicious honey-mustard dressing .I really enjoyed this ( and you know me with veggies ) . 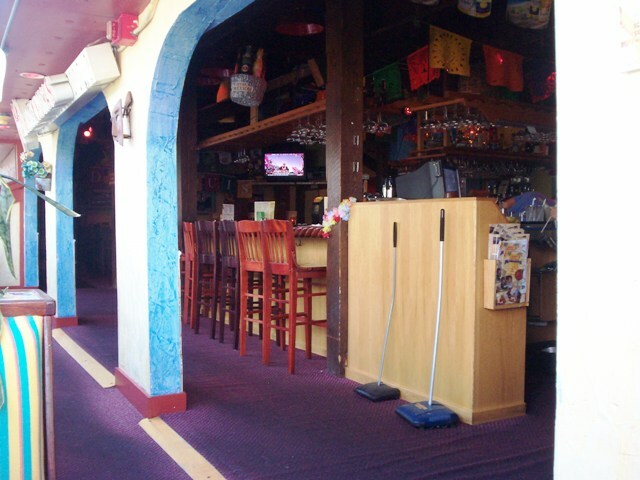 MARGARITAS has an extensive menu of all your favorite Mexican dishes. Just click here to get their full menu. During our meal it was fun to hear Laura apologizing for all the stairs I had to walk up ( and now down ) .She also admitted that it was a lot of trouble to go through for lunch. But she didn't know and neither did I . You can be sure I'll always check out a new restaurant from now on. Right before we left we saw an older couple , the man with a cane , and worried for him going down all those stairs. Same for the woman with the baby carriage . She bopped that kid down each step one at a time . That baby must have been either laughing or crying. I'm willing to bet both those people weren't aware of the stair or parking situation. We checked out the ladies room before we headed back down and found it not only NOT handicapped accessible but very messy . One stall was out of order and the trash was overflowing plus the sink was all soapy . And the place wasn't even busy yet . It was still early . This is a no-no in my book . THE VERDICT: The food was terrific , I wouldn't mind having it again. But it's not worth the hike up the stairs , at least for me. I'll have to check out their other locations ( there are 21 in New England ) to see how they are situated .So go and enjoy , just wear your hiking shoes. Margaritas Mexican Restaurant is open daily from 11:30 a.m. to 10 p.m. The dining room closes at 11 p.m. on Friday and Saturday, and the lounge closes at 1 a.m. Sunday through Thursday, and 2 a.m. Friday and Saturday. After leaving MARGARITAS , we discovered that we were only 6 minutes away from BLEU SQUID , a lovely bakery , cheese shop and grilled cheese cafe with luscious pastries , homemade soups and great salads . We decided to visit and bring some goodies home for the following day. BLEU SQUID is located right in Mystic Village amongst a plethora ( ooooh like that ?) of little shops . You can spend the whole day here shopping around . But we were here for goodies so we made a bee-line for the bakery . We bought 2 large , very large cookies ( chocolate chunk & peanut butter chip ) , 2 brownies ( chocolate cheesecake & chocolate peanut butter ) ( which Paul ate as soon as we got home ) lol ,and 4 cupcakes ( banana, chocolate coconut, bailey's and pineapple cream cheese ) . Doesn't that all sound yummy? Well , it was . 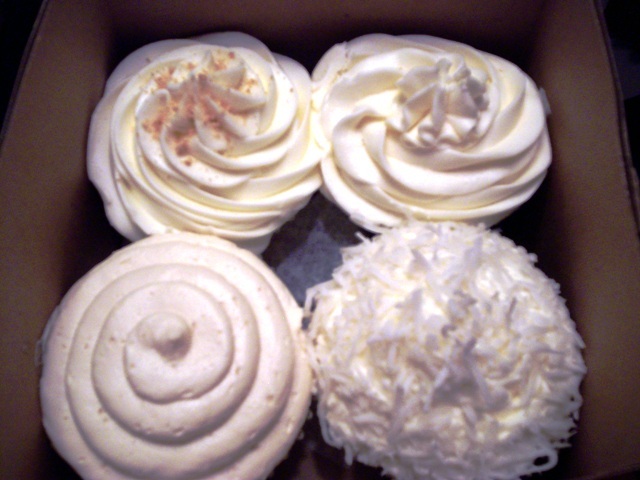 We took a picture of the cupcakes to show you but we didn't realize they all had light frosting .lol You can't really distinguish them from one another , so click this to see other purchases we've made in the past , that were a bit more colorful. 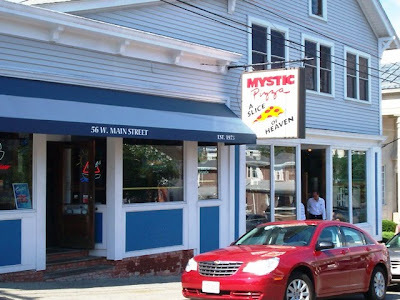 If you go to Mystic stop into BLEU SQUID .I think you'll really be impressed by what they serve. Bleu Squid is open from 10 a.m. to 6 p.m. Monday through Saturday, and from 12-5 p.m. Sunday. After placing the goodies in our handy ice bag ( we come prepared ) we headed to our final Connecticut destination ...BUTTONWOOD FARM ICE CREAM or as their sign says ...BUTTONWOOD FARM- FARM FRESH ICE CREAM . We heard about this place from a couple of our fans , thanks Annette and Chris! And the things we heard were wonderful ,so you know we had to check this out. We both have an ice cream addiction. 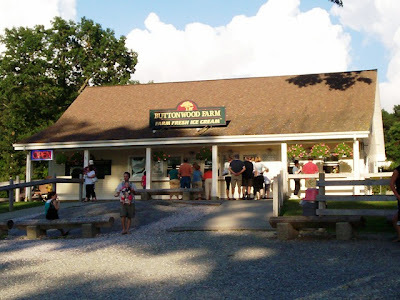 It was about 30 minutes from BLEU SQUID to BUTTONWOOD , and we arrived around 6:30pm. What a lovely ride . 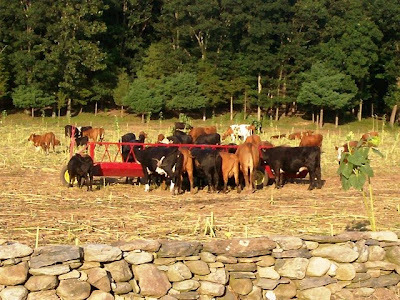 This area is a picture perfect idyllic New England countryside. 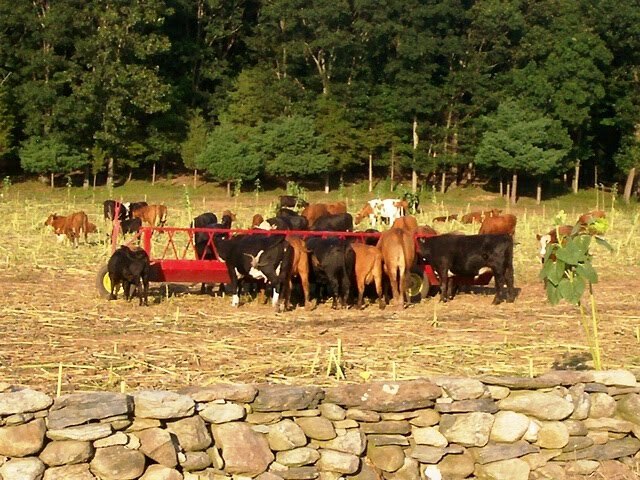 Cows in the field , roosters strutting their stuff ( and begging for waffle cones ) lol and farmers tending to their herds. This is God's country. 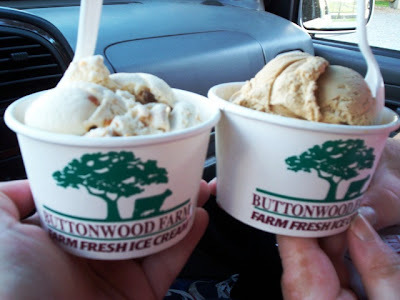 And in the middle of it all is BUTTONWOOD FARM ICE CREAM . When you pull into their lot , you have to be quick to get a parking spot. It's busy, but everyone sure seems happy to be in line.lol The building itself is long with several service windows . 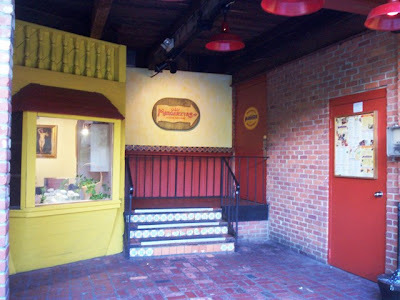 Since I was still recuperating from the "stairs" , Laura went to wait in line for our order . We both wanted small cups . Me, coffee of course.and Laura, Butterfinger ( caramel ice cream with Butterfinger candy crushed up into it ) . P.S. Only one oops . Laura said the girl who waited on her was " out to lunch". When Laura ordered our 2 flavors of ice cream , the girl presented Laura with 1 cup , with both our flavors in it , one atop the other . Laura said , NOPE, a cup of each , to which she replied , " I'll have to do it all over " . Laura said , " I'll wait ". lol Maybe she was having one of those days . 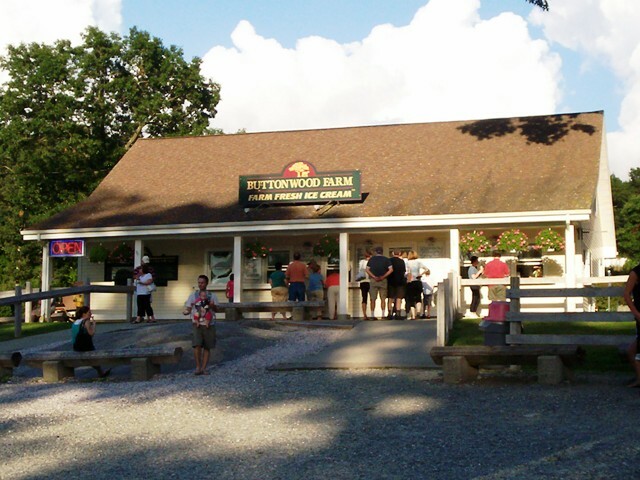 Buttonwood Farm Ice Cream is open from March 1 until October 31. 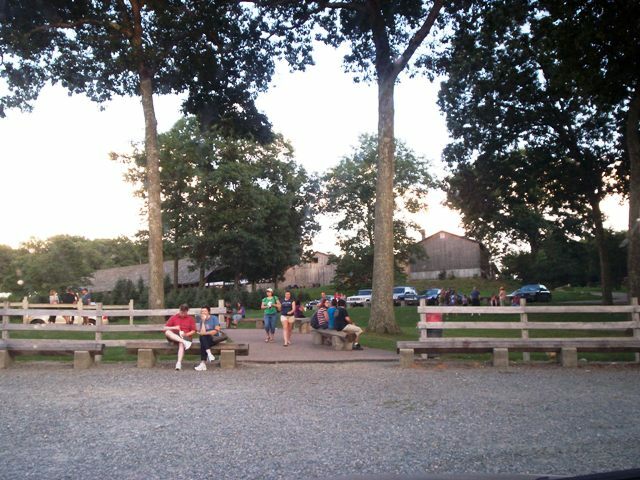 The hours are from 12-9:30 p.m. Monday through Friday, and 11:30 a.m. to 9:30 p.m. Saturday and Sunday. 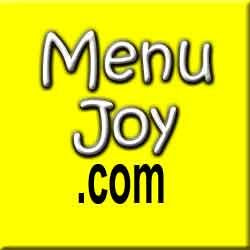 Don't forget to visit MenuJoy.com for some great area menus!